The kit brings everything you need to assemble your first custom loop. You don't have to worry about compatibility issues or being nervous about the right amount of fittings or tube length. If you are a beginner, this is a great place to start! EK-Supremacy MX - universal CPU water block that fits all modern CPU sockets with a universal mounting mechanism that offers error-preventing, tool-less installation. The result is an easy installation which brings perfect performance every time. Built upon the same cooling engine as EK-Supremacy EVO it offers the same great hydraulic performance and almost identical thermal performance. EK-CoolStream SE 240 radiator - it gives this kit its name - offers best cooling capacity in the 25mm thick radiator class: copper fins provide massive surface area while the parallel flow cooling chambers reduce hydraulic flow resistance to a minimum. Built for EK-Vardar120mm high static pressure fans, these radiators are optimized for maximum heat dissipation across entire fan operational range thus delivering exceptional performance at both low- and high airflow operation. EK-Vardar - industrial grade high-static pressure computer cooling fan, designed and built primarily for highest-performance computer liquid cooling systems. EK-Vardar is simply the best choice for computer radiator cooling as it provides unmatched performance throughout the entire operating range. EK-XRES 100 SPC-60 MX PWM (incl. 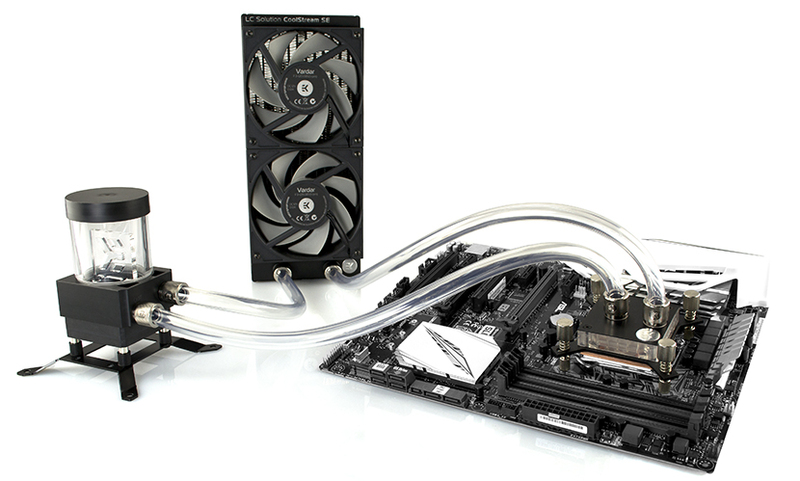 pump) - is a value oriented water cooling pump reservoir combo. It has been designed to lower the production costs yet still offer premium hydraulic performance at the best price. PWM control allows for automatic pump speed regulation depending on your CPU temperature. Full performance on demand or whisper quiet operation in idle mode! EK-DuraClear - 2 meters of the premium quality clear PVC tubing, guaranteed to be free of plasticizer leaching related issues. The majority of components has been pre-assembled resulting in quick and painless installation procedure. Once installed, this kit is a full custom loop solution. It can be upgraded with additional water blocks and components, such as additional radiators. EKWB recommends use of fan regulation adapters in case your motherboard does not support fan speed regulation. Such devices are not included in kit. They can be purchased separately here. EK-FC1070 GTX is a high performance full-cover water block for NVIDIA® GeForce GTX 1070 Founders Edition graphics cards. The EK-KIT P240 is the ultimate liquid cooling kit dedicated to all users who seek the easiest way to start with their first custom loop at the best price-performance ratio on the market! Everything you need to assemble your first custom loop with carefully chosen components that will last you a long time!